And from the same Divine Light all creation sprang. Into the high and the low? Into vessels of diverse shapes. Since free from taint is the Divine Potter. The allusion to the different vessels of clay and the one Divine Potter, reminds us that despite apparent differences, we are all equal members of our one human race. This verse or shabad taken from the Sikh Holy Scriptures, the Guru Granth Sahib, in many ways encapsulates both the thrust of Sikh teachings and the central theme of this historic Parliament, in its emphasis on the absurdity of all man made distinctions of birth, class or creed. Other verses in the Guru Granth Sahib make clear that this equality also extends to full gender equality. Sikhism is one of our different paths towards a summit of understanding of our common responsibility to the Creator, to work for the benefit of our fellow human beings. Sikhs believe our different paths are not mutually exclusive, but frequently merge to give us both a heightened understanding of our own faith and our common responsibilities. Our Gurus emphasized respect for other ways of life in many different ways, Guru Arjan ,the fifth of our 10 founding Gurus incorporated some uplifting verses of Hindu and Muslim poets into the Guru Granth Sahib Sahib, including the one I’ve just read, to show that no one religion has a monopoly of truth and all faiths should be respected. I am delighted that this Parliament has set its goal as the reclaiming of our common humanity. It is a recognition that religion has largely failed to move minds to what Sikhs call a gurmukh or Godly direction, by making concern for others central to all we do. Instead of recognizing the common thrust of our different faiths, we have set barriers of belief between them smugly, and sometimes violently, proclaiming our superiority and exclusive path to God. Our failure to give a clear ethical lead centered on compassion and concern for others, has led to a society obsessed in searching for contentment through material possessions, creating a selfish society in which the vulnerable suffer. Our common task is then to reclaim the heart of society by working together to create a more responsible society. To be successful, we must boldly challenge what are becoming warped norms of putting self before others, and political agendas, both domestic and international before ethical concern for what Sikhs in our daily prayer, refer to as the well-being of all humanity. If we do this, we are bound to be successful in reclaiming the heart of humanity. The Global Sikh Council (GSC) condemns the decision of politically appointed jathedhars to exonerate Gurmeet Ram Rahim Singh of Dera Sacha Sauda for causing gross offence to Sikhs. Gurmeet Ram Rahim Singh is guilty of causing offence to Sikhs by impersonating Guru Gobind Singh ji. Politically appointed jathedhars have no authority to dictate to, or act on behalf of, the wider Sikh community. All Sikhs should be aware that the SGPC, who appoint jathedhars, was created by the British government to manage the financial affairs of the historic Sikh gurdwaras and nothing more. 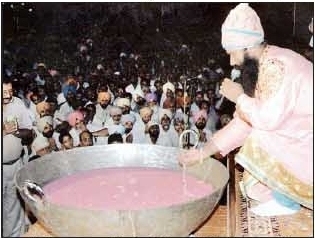 The composition of the SGPC is based on political allegiances and not on a commitment to follow the Gurus; teachings. Over the years, especially after 1947, the SGPC has been dominated by political groups and is being used to further the personal interests of local politicians. During this time it has arbitrarily created figures of supposed authority over Sikhs worldwide, like Jathedhar of the Akal Takht, and the absurdity of ‘Sikh High Priests’. Arrogantly, one Jathedhar of the Akal Takht on a visit to the UK, demanded to be introduced as ‘the Pope of the Sikhs’. The GSC urges all Sikhs to condemn the arbitrary decision of Jathedhars to exonerate Gurmeet Ram Rahim Singh and further urges Sikhs worldwide, to support the GSC in its aim of ensuring panthic decisions are predicated on the teachings of the Gurus and not on questionable political allegiances. The Network of Sikh Organisations is a member of the GSC, the statement was originally issued on the 29 September.